Another Landry innovation; the Multiple Formation Offense. Every time you see a coach disguising a simple play with an bizarre formation, you’re seeing a Landry principle at work. The Man in the Hat also gave us the Shotgun. He took a failed experiment from the early 1960’s and turned it into standard operating NFL procedure. He was doing what today is commonplace in professional football two and three decades before it caught on. Of all his innovations, only Landry’s Flex Defense has failed to endure that is for one simple reason. It was so complicated nobody, except for the master himself, was smart enough to teach it. Stoic as he was, Landry had some P.T. Barnum beneath the poker face. He loved to put on a show. One of his signatures was the gadget play. He liked to call them “exotics”. That was a little more corporate. Trick play and gadget play sounded impulsive, like something drawn up in the dirt. 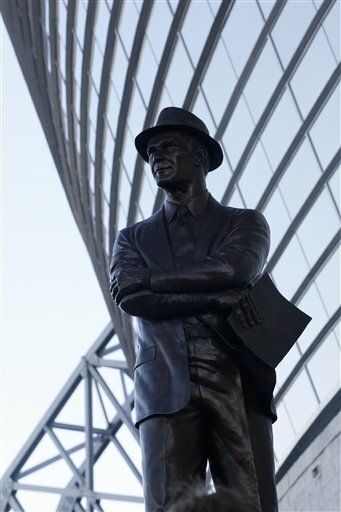 And Tom Landry planned everything. In the Ice Bowl, he burned Lombardi’s Packers for a touchdown by calling a halfback option pass for Dan Reeves. In Super Bowl VI he called a tight end around with slow-footed Mike Ditka (it gained 17-yards and set up a touchdown). On the opening kickoff of Super Bowl X, Landry caught Chuck Noll off-guard by calling a return reverse with linebacker Thomas “Hollywood” Henderson (he gained 48-yards). In Super Bowl XII, fullback Robert Newhouse launched a 29-yard halfback option pass to Golden Richards to seal the Cowboys victory. Sometimes, Landry could outsmart himself. On the opening drive of Super Bowl XIII, Tony Dorsett was shredding the Steel Curtain on the ground but on first down at the Pittsburgh 34, Landry called a double reverse which was fumbled and the Cowboys lost valuable momentum. 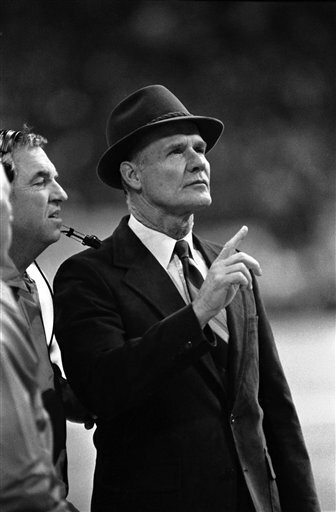 His players insist the Cowboys lost Super Bowl V because Landry, with two weeks to prepare, scrapped his initial game plan only days before the game. After seeing it in practice for a week, Landry decided he could come up with a better one. Dallas lost to Baltimore 16-13. In 1971, Landry decided to alternate Roger Staubach and Craig Morten on every play. How, he wondered, could the defense adequately prepare for two quarterbacks with such differing styles. The Cowboys rolled up almost 500 yards of total offense but lost to the lowly Bears 23-19. The whole was less than the sum of its parts. As brilliant as Landry was, he failed to grasp what was obvious to most armchair coaches, a football team needs an unquestioned leader to succeed. Two quarterbacks is one too many. There’s much more to the real man, of course. His heroism as a B-17 bomber pilot in World War II, his rivalry with Vince Lombardi when both men were assistants with the Giants in the 1950’s and his discomfort with the Dallas Cowboys being marketed as America’s Team. All that, and more, is in the film itself. So, how did this man become a larger than life legend? How, exactly, does the magic work? People forget that in Landry’s final season, the Cowboys won just three games. But something mystical happened when Jerry Jones fired Landry on February 25, 1989. “The place that a great man holds in history,” James MacGregor Burns noted in his epic biography of Franklin Delano Roosevelt, “is largely determined by the manner in which he makes his exit from the stage.” That’s why John F. Kennedy, after his heroic triumph in the Cuban Missile Crisis, joked that it might be a good night to go the theater. Lincoln belongs to the ages not just because prevailed in the Civil War, but because he exited the stage at his zenith. The bullet in John Wilkes Booth’s Derringer made Lincoln a martyr and that’s how we remember him. The magic of myth works the same for statesmen and football coaches. Why are Knute Rockne and Vince Lombardi to this day the gold standard for coaching? They both died tragic deaths at the top of their game; Rockne the victim of a plane crash in a Kansas cornfield, Lombardi ravaged by colon cancer in the midst of rebuilding the Washington Redskins. Landry was no longer at the top of his game when he was fired but the same dynamic has gave the Man in the Hat his place in the mystic chords of our cultural memory. He, too, went out a martyr. As Pete Rozelle sadly remarked after Landry’s firing, “It feels like the day Lombardi died.” And that’s why Landry will always be larger than life.